At the end of August, we took a break from weddings to spend an incredible weekend helping produce the first ever Lindsey Vonn Foundation Summer Camp for Girls. Along with Lindsey Vonn, the Lindsey Vonn Foundation, and ZGiRLS, we spent two days at the Vail Mountain School with 90 girls aged 11-16. We combined activities like yoga, hiking, ultimate frisbee, an obstacle course, and team-building activities with three sessions based on the ZGiRLS curriculum, designed to help empower girls, build confidence, and promote positive body image. It all started on Saturday morning, with girls arriving and picking up their LVF swag before breaking out into groups to meet one another and play “Guess Who,” then headed to the first ZGiRLS Huddle on mental awareness, talking about swapping negative thoughts and directions like “Don’t lean back!” with positive ones like “Lean forward!”. Then we put it all into action with two huge games of soccer and ultimate frisbee. Remember, kick with your laces and try to keep the frisbee level! That afternoon, after a surprise water balloon toss (perfect for a hot late-August day in the mountains! ), we broke into another Huddle to talk about positive self-talk. Replacing “I was awful at practice” or “I can’t believe I missed that goal” with “I need to work on my serve” or “I may not have scored, but I tried my hardest” is a lot harder than it sounds! 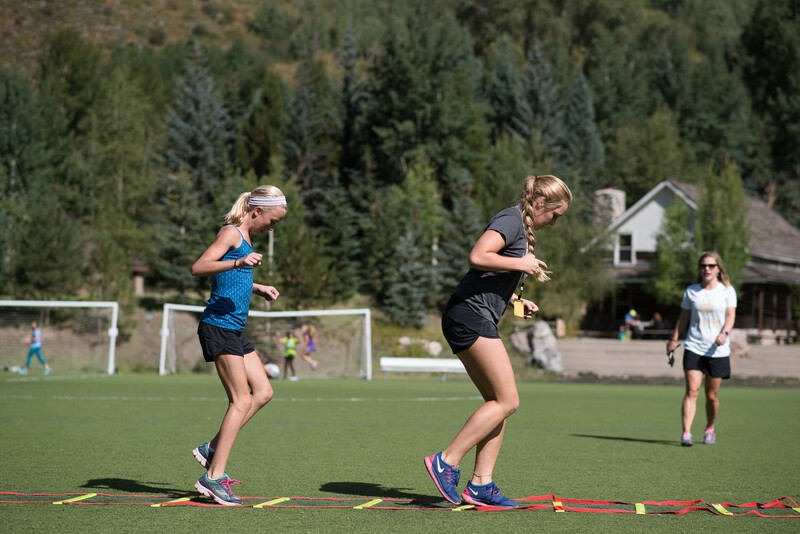 Again, theory became practice with an epic obstacle course that led all over the Vail Mountain School campus, encouraging the girls to be aware of their thoughts and replace the negative with the positive. Day One wrapped up with yoga, followed by a Q&A with Lindsey. We couldn’t believe what great questions the girls asked, from what gets Lindsey out of bed in the morning (knowing that her competitors are on the slopes, not hitting snooze!) to what she loves to do on her days off (watch TV and eat ice cream in bed with her two dogs, Bear and Leo). Then it was time for a little rest before Day Two! On Sunday, we kicked the day off with a dance session, followed by a discussion about teamwork with ZGiRLS founder (and Olympian) Libby Ludlow and co-founder Jilyne Higgins. The girls helped us create a list of characteristics every strong team should have, from open communication and acceptance to friendly faces, humility, and trust. We put teamwork to the test with Human Knots and the Magic Carpet Challenge, then broke into huddles to build confidence and talk about the people in our lives who support us. The World Cup Challenge had everyone completing physical challenges from burpees to bear walks and learning about Lindsey’s World Cup appearances along the way. After lunch, the teams headed out around the school to complete a photo scavenger hunt, with the winners getting points for creativity and receiving signed Lindsey Vonn posters. Then it was up to Booth Falls, a 4.6 mile hike to a gorgeous waterfall high above Vail. At the end of the day, we invited parents to join us for a recap of the weekend’s activities and huddles, and surprised everyone with a video (check it out below!) and a raffle. Next PostNext A Whirlwind Trip to the St. Regis New York – and the Marchesa Couture Show!